Enthusiast of nature since he was very young, his interest in photography started in 1979, but it was not until 1982 that he purchased his first reflex camera. Since then on, he has photographed the natural world and has widely travelled throughout Spain and the rest of Europe eager to portray and show the nature surrounding us. His works appear in national and international publications: magazines, books, posters, calendars, catalogues, etc. He has also contributed to encyclopedias, as the collection “Fauna de La Rioja” for which he was appointed as Main Photographer. Several exhibitions such as La Rioja Tierra Abierta, Fauna de La Rioja, La Biodiversidad Amenazada and others have exhibited his images. He has collaborated in audiovisuals and has given lectures and slideshows about photography and travels. 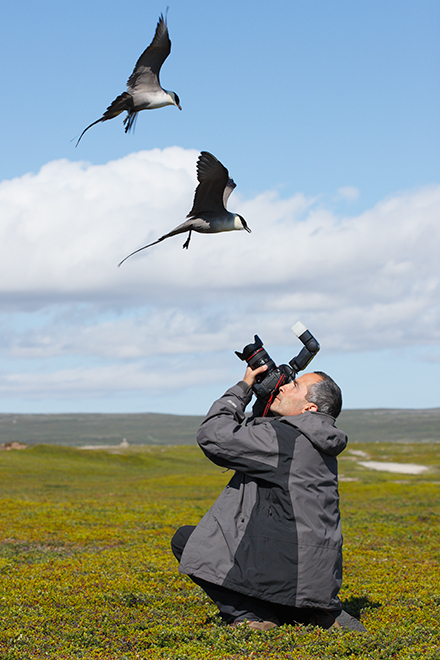 Co-founder of the Spanish Association of Nature Photographers (AEFONA), his work has been distinguished in different competitions. In 2001 he was awarded a 1st prize in the BG Wildlife Photographer of the Year Competition, which is considered the most prestigious contest in nature photography, organized every year by the Natural History Museum of London and the BBC. In 1996 he had already won a Highly Commended award in this same competition.